IndianOil Aviation Service is a leading aviation fuel solution provider in India and the most-preferred supplier of jet fuel to major international and domestic airlines. 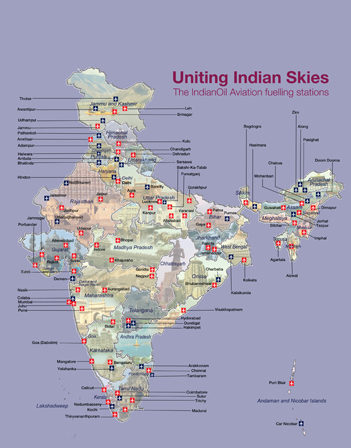 Between one sunrise and the next, IndianOil Aviation Service refuels over 1,750 flights, that is more than one aircraft per minute ï¿½ from the bustling metros to the remote airports linking the vast Indian landscape, from the icy heights of Leh (the highest airport in the world at 10,682 ft) to the distant islands of Andaman & Nicobar. Jet fuel is a colorless, combustible, straight-run petroleum distillate liquid. Its principal uses are as jet engine fuel. The most common jet fuel worldwide is a kerosene-based fuel classified as JET A-1.The governing specifications in India are IS 1571: 2001 (7th Rev). IndianOil is the only oil company in India to market the widest possible range of fuels used by the aviation industry in India- JP-5, Avgas 100LL, Methanol Water Mixture, Jet A-1 and aviation lubricants, etc. Aviation Turbine Fuel (ATF) is dispensed from specially designed refuellers, which are driven up to parked airplanes and helicopters. 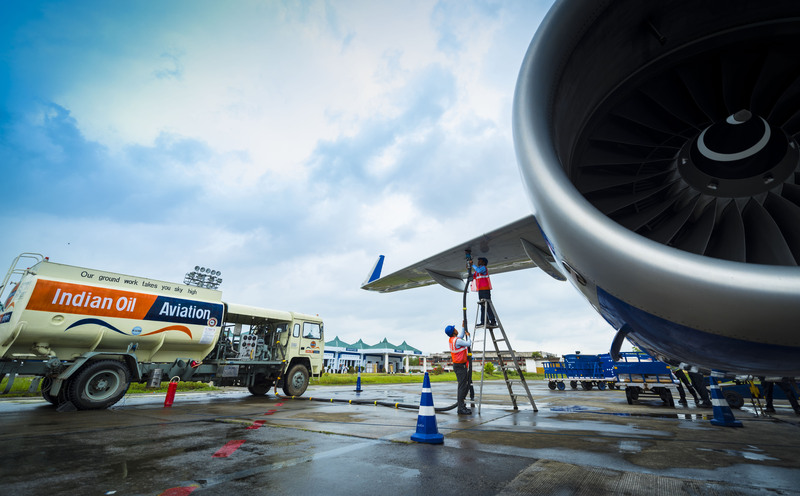 Major airports have hydrant refuelling systems that pump the fuel right up to the filling outlets on the tarmac through underground pipelines for faster refuelling. Essentially, ATF is pumped into an aircraft by two methods: Overwing and Underwing. Overwing fuelling is used on smaller planes, helicopters, and piston-engine aircraft and is similar to automobile fuelling - one or more fuel ports are opened and fuel is pumped in with a conventional pump. Underwing fuelling, also called single-point is used on larger aircraft..
To ensure that you receive the best service, every one of our 110 AFSs follows specific quality audits based on a Quality Control Index System benchmarked to global standards. In addition, 15 Quality Certification Laboratories provide complete specification tests round-the-clock. Ensuring that these standards are always upheld, there is a back up of a highly skilled, qualified and dedicated team of officers and refueling crew. IndianOil has a strategic partnership with Air BP, the world leader in aviation business. IndianOil regularly organizes seminars, symposiums and workshops to constantly interact with its partners, which apart from being a two-way channel of communication, helps us to stay abreast with advances in technology.